Coverage: Live coverage on BBC Two (Thursday & Friday, 13:00-17:15 BST, Saturday & Sunday, 14:00-18:00 BST), BBC Sport website, plus desktop, tablets, mobiles and app. Teenage stars Charley Hull and Lydia Ko secured a significant boost ahead of this week's Women's British Open at Turnberry. Inspired scheduling by the Ladies European Tour (LET) provided a perfect tune-up for the next women's major with last week's Scottish Ladies Open at Dundonald. Hull, 19, and 18-year-old Ko were among several top players who took the chance to hone their seaside skills before the Turnberry test. The style of golf required to succeed on the Ayrshire course is vastly different from that which usually suffices on the women's tour. The need for low trajectory strikes to keep the ball under the wind, and bump and runs around undulating greens, are largely alien pursuits on the LET and LPGA tours. So the decision to play the Scottish Open on a links in the slot immediately before the British major made complete sense. With the entries of world number two Ko and the seventh-ranked Suzann Pettersen, the scheduling has been already totally vindicated. It follows the lead set on the men's European Tour, where for the last five years a links course has been used to stage the Scottish Open immediately before the Open Championship. Zach Johnson's St Andrews victory last week was the exception to prove the rule because it is the only occasion since the switch that someone from the Scottish field has not gone on to become the 'Champion Golfer of the Year'. Certainly Ko, Hull and Pettersen have given themselves a head start. 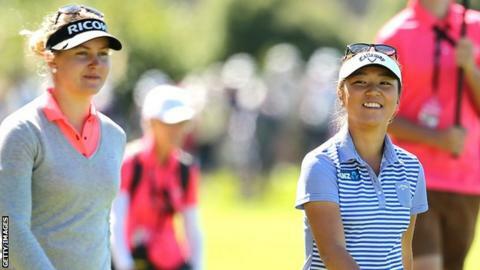 "It was good preparation for the Women's British Open," said Ko, who finished in a share of fourth place at Dundonald. "I don't know what the weather will bring next week but that was the big thing, to get more experience playing links golf." As she has done throughout her short but astonishing career, Ko showed remarkable maturity in her first professional tournament in Scotland. She embraced the demands of links golf, relishing the chance to hit different shots and trajectories. The New Zealander appears to have a similar mentality to Masters and US Open champion Jordan Spieth, with an uncanny knack of eliminating mistakes and maximising scoring potential. Hull, by contrast, is blessed with immense natural flair and power that, when fully harnessed, enables the Kettering star to separate herself from high-quality fields. At Dundonald she showed glimpses of this quality before finishing tied eighth behind the winner, Australia's Rebecca Artis. Now Hull turns her attention to Turnberry where a decade ago, as a child prodigy, she won a national competition as a mere nine-year-old. "Good memories definitely help," Hull told BBC Sport. "I won the trophy and it was quite a big thing for me back then. "You know, I just love the golf course but I can only remember a few holes because it was so windy and rainy that day, I didn't get to take it all in." Despite her tender years, Hull heads to the British Open as a seasoned campaigner having won on the LET and contended in majors in the United States. She was a leading performer in Europe's record Solheim Cup victory in Denver two years ago. But these achievements have been left in the shade by the precocious skills of Ko, who has already enjoyed a spell as world number one. She has seven victories to her name and currently trails only Inbee Park in the rankings. Hull relishes the prospect of a long-term rivalry with the Korea-born Kiwi. "Lydia is really good for the game," she said. "It's good out there battling with her. It's evolving quite well and it is good to be part of it. "You always want to be chasing the number one player. It's a lot of fun to be doing that and we are a similar age too so I know it can be done. "I like Lydia, she's a good friend and the future is going to be good." It will be fascinating to see how the two teenagers fare at Turnberry, especially with the experience of three testing days at Dundonald behind them. There was enough to suggest they are well capable of challenging but they were not alone in impressing last week. As runner-up, Norway's Pettersen must feel her links game is capable of landing a third major title, while there was much to encourage hopes of British success. Grimsby's Holly Clyburn, 24, was third and continues to show that she is maturing into a fine player. Nairn's Pamela Pretswell, 26, was only outscored by the eventual champion over the final two rounds. The Scot surged into the top 10 despite opening with a potentially ruinous 79. Both are looking forward to trying to raise their game further at a time when British golf can feel a good deal of optimism. That was illustrated in the men's game by the excellent and youthful English clean sweep at the European Masters in Switzerland. Danny Willett edged home ahead of Matthew Fitzpatrick and Tyrrell Hatton. A similar showing from their female counterparts in Ayrshire this week would do wonders for the women's game.